State Department spokeswoman calls out Israel over plan to demolish the home of a terrorist who carried out a tractor attack. 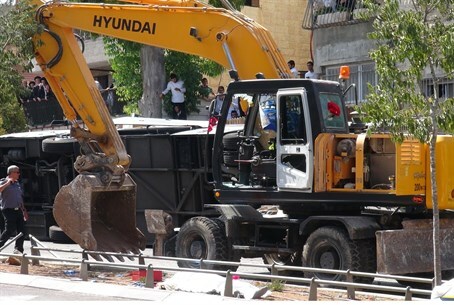 Israel on Thursday ordered the demolition of the home of a terrorist who carried out a tractor attack in Jerusalem this past summer, raising the ire of the United States. The terrorist whose home is to be demolished is Mohammed Jabis, who slammed his tractor into a bus in Jerusalem in August, killing Rabbi Avraham Walles and injuring six other people. According to a report in Haaretz, Jabis’s family received notification about the impending demolition. Jabis himself was killed by security forces after carrying out the attack. State Department spokeswoman Jen Psaki was asked about the demolition during her daily press briefing on Thursday. “Well, we believe that punitive demolitions are counterproductive to the cause of peace and exacerbate an already tense situation,” was Psaki’s response. “Beyond that, I don’t have any additional details on their plans,” she added. The comments mark the second time in two days that Psaki has criticized Israel. On Wednesday, the State Department spokeswoman sharply condemned Israeli plans to build 200 new Jewish homes in Jerusalem's Ramot neighborhood, warning such moves would only "exacerbate" spiraling tensions in the city. She also blasted an arson attack on mosque in a Palestinian Arab village, which Palestinian Authority security officials blamed on "extremists Jewish settlers" - despite reports that it may have been a deliberately misreported electrical fire. "The United States condemns the attack against a mosque in the West Bank. We believe that such hateful and provocative actions against a place of worship are never justified," Psaki said. She urged "law enforcement officials to quickly investigate and bring to justice the perpetrators." On Thursday, Psaki was also asked why Palestinian Authority Chairman Mahmoud Abbas was not included in a meeting in Amman between Secretary of State John Kerry, Prime Minister Binyamin Netanyahu and Jordan’s King Abdullah.